The service operates in the evening between 18:00 and 22:00, Mondays to Fridays. The service is available to anyone who lives within Glasgow City, Cambuslang/Rutherglen, East Dunbartonshire or Renfrewshire. However, space is limited and we will give priority to passengers travelling to their nearest hospital, to older people (over 60), people living with a disability or those in receipt of benefits. 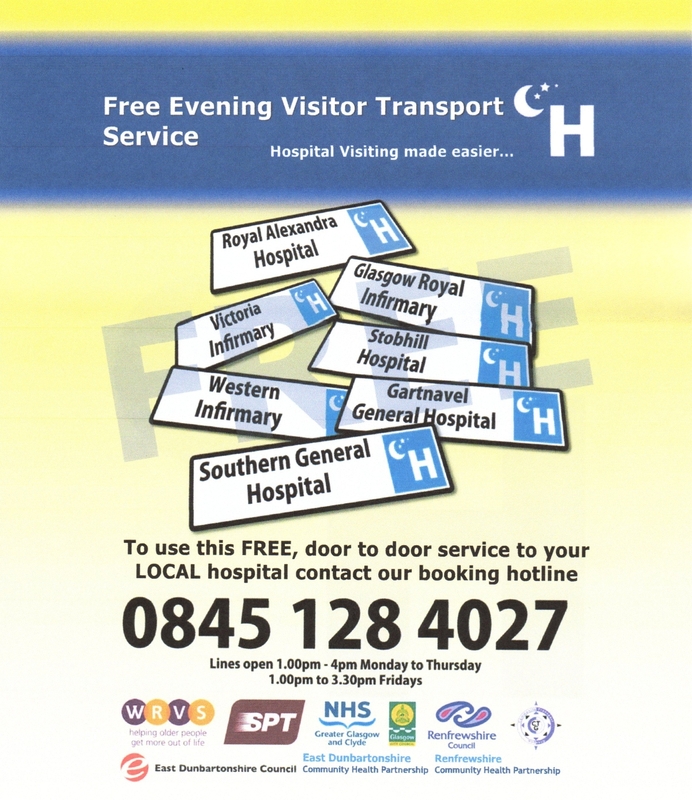 If you wish to visit a hospital other than your nearest one, please call the booking line after 15:00. What happens the first time I call? When you call for the first time, you will need to register. You will be asked for information to monitor who uses the service. You will only need to give this information once. All information will be treated in the strictest confidence and in compliance with the Data Protection Act. What happens when I call to book the service? Your pick-up time will be confirmed by telephone. You will be collected as near as possible to your front door. You can book transport up to one week in advance provided you are visiting your local hospital. This is to ensure that everyone who needs the service has an opportunity to use it. The service is operated by Community Transport Glasgow (CTG). Further details are available from Strathclyde Partnership for Transport (SPT).